(September 17, 2010 - Toronto, ON - For Immediate Release) Today Michelle Bourdeau, Manager, Residential Planting Programs, LEAF (Local Enhancement and Appreciation of Forests), Waterloo Mayor Brenda Halloran and Councilor Mark Whaley, who is also a representative of the 10,000 Trees Project, launched LEAF’s Cool Communities Residential Shade Tree Planting Program in the Waterloo area with a tree planting in the yard of Waterloo residents Eric & Jordan Hoshooley. The program, funded by the Ontario Power Authority, provides subsidies of up $100 per household on native trees and shrubs and is designed to aid homeowners in strategically planting for shade and windbreak that will result in home energy conservation. 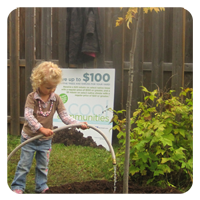 Participants can visit the Cool Communities booth at either Grand Valley Garden Village or Sheridan Nurseries Limited in Kitchener to receive the rebates. The booth will provide customers with information on how to choose appropriate trees and shrubs for their property, the best planting locations and how to provide proper care after planting.